Right now, fired FBI Director James Comey is testifying before the Senate Select Committee On Intelligence regarding Donald Trump’s possible attempt to obstruct an investigation into Russia’s influence on the 2016 election. And like nearly every other big moment in the Trump presidency—whether it be the Trumpcare saga, that insane press conference, or that spooky inauguration—we’re all expecting it to get sliced, diced, and air-horned by video editor Vic Berger. Well, it is. Right now. Super Deluxe is currently live-streaming Comey’s testimony, editing in its signature flourishes in real time. 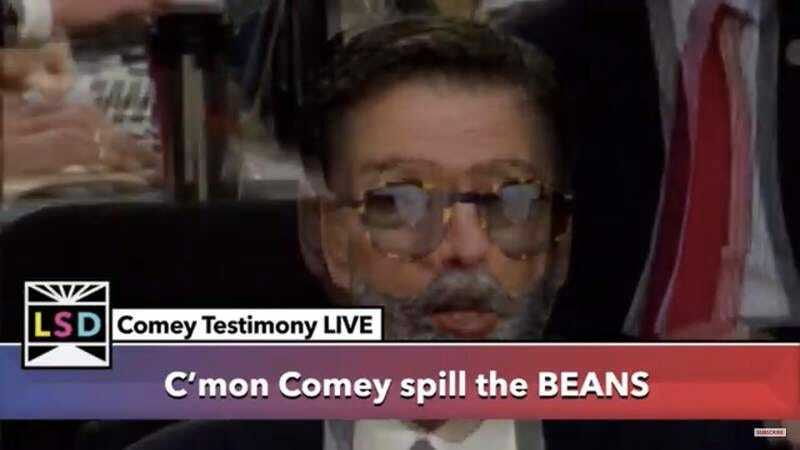 So, if you’re getting bored waiting for Comey to personally name Trump as the antichrist (and aren’t following along with our live breakdown of the testimony), tune in for some added entertainment. So far, we’ve seen Comey recast in countless Snapchat filters, heard “The Sound Of Silence” over zooms into Comey’s tired eyes, and seen a pair of thumbs twiddling endlessly. And the air horns. Oh, dear, there are air horns. We can only guess they’re waiting on pins and needles for Trump to give them the gift of his own tweets.